Investing in an electric chainsaw may seem rather dramatic and a little dangerous, and you’re not wrong, but they can also be incredibly useful for garden jobs where manual tools just won’t suffice. We've rounded up the best electric chainsaws, both electric and cordless, to help you choose, plus included a few buying tips for first-timers (be careful out there people). Once you've chosen a chainsaw, why not check out more buyer's guides and visit our garden hub page for more buys, advice and design ideas? The most important thing when buying an electric chainsaw is to ensure you are aware of how they work and undertake all the correct safety procedures when using one. Ultimately, electric chainsaws are the most affordable type you can get, and are probably the simplest to use. Rather than having that uneasy moment of pulling on a petrol chainsaw like you’re the baddie in a terrible horror movie, an electric chainsaw takes the uncertainty out of operating it with the comfort that it can be stopped and started at just the touch of a button. Electric chainsaws are the lighter of the bunch in terms of what they can do, but unless you are a professional arborist or have experience with using chainsaws, we recommend any job that can’t be done with an electric chainsaw be done by a professional. Using an electric chainsaw over petrol ones is naturally going to release less emissions and noise pollution which is always a plus for working in residential areas, and ultimately not upsetting your neighbours when you decide to chop down your tree at 7am on a Saturday morning. Most electric chainsaws can be purchased for between £100 to £200 depending on what kind of features you’re looking for. Some come with an extra-long cord which is useful if you have a big garden, and some are cordless, but this does mean they only have a certain battery life. We’ve broken down the good and the bad of some of the best electric chainsaws you can by, so check out our guide before you buy! Anyone who has struggled with a petrol-based chainsaw may want to give this electric one from Black and Decker a try. This lightweight electric chainsaw has been designed with comfort in mind; it’s cordless for ease of movement, and has a safety lock which means it can only be activated by two buttons being pushed simultaneously. The cordless design does mean limited battery life, but the battery is clearly indicated with LED lights so you know exactly how much power is left for you to get your job done. It’s said to be quiet (as quiet as a chainsaw can be), and it has an anti-kickback chain to ensure your safety, as well as being able to self-oil itself to keep it working smoothly at all times. If you’re a complete novice, then this is the electric chainsaw for you. If the thought of handling a chainsaw absolutely terrifies you, then you can feel safe in the knowledge that this Makita model has everything you need to carry out small garden jobs safely and with ease. The extra-long cable means continuous power without compromising on ease of movement and it also has a guide bar to help you keep control when it’s in use. It’s not really recommended for bigger jobs, but if this is your first time using an electric chainsaw then you can expect this one to help you feel comfortable handling such a large piece of equipment. For something with a little more oomph, the Bosch AKE 40 boasts a little more power and balance which makes it easier to carry out jobs with precision. Users who have this electric chainsaw found it easy to assemble and to use as it is easy to hold and relatively quiet which is a bonus. Some customers have noticed that the chain bounces off sometimes but this is usually down to the way you are holding the chainsaw, and can be rectified over time with experience. The Ryobi is another powerful entry, with some users stating they’ve even used this chainsaw to cut down a tree (over a period of time, of course). If you’re familiar with chainsaws, then this one should be fairly intuitive to use, it doesn’t require much assembly, and it has a fast chain speed which allows for you to really go to work on whatever you’re sawing. It is said to be very efficient at wood cutting but be careful not to let the blade touch the ground as this will blunt it. It comes with 100ml of oil already topped up, but you will need to invest in more oil if you are planning on carrying out bigger jobs on a regular basis. Overall, this electric chainsaw has some power behind it and you can expect it to work just as well as a petrol-based chainsaw. If you’ve got annoying branches that are obstructing light in your garden, then using this saw with an extended arm is the best way to safely cut them down. The chainsaw itself is lightweight, making it easy and comfortable to hold when cutting branches. It can read a total of 4.5 metres overhead and has non-slip grips so you can be sure you have control at all times. It clips apart for easy storage and transport, just keep an eye on the chain which can sometimes come loose if in the wrong position. 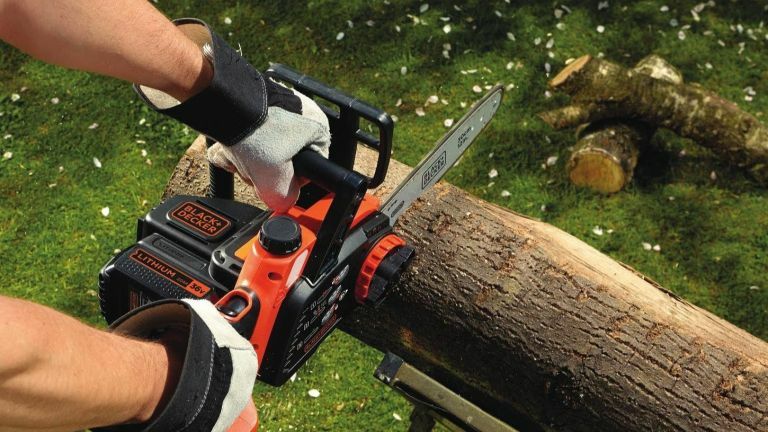 This compact chainsaw is perfect for the smaller jobs in the garden. It is lightweight and efficient, which users say is perfect for light trimming and pruning. The oil reservoir is easy to refill and the chain automatically lubricates for smooth results, but some find it a little uncomfortable to hold compared to a full-sized model. If you’re only planning on doing some work that requires a chainsaw occasionally, this could be a worthwhile investment that doesn’t take up too much room in the tool shed.